We are literally getting ready to usher in a new year as I sit here typing this. The end of the year always prompts a lot of reflection, and I can’t help but look back on this past year in amazement. My daughter has grown leaps and bounds this year. It’s been amazing to watch her imagination blossom, to see her develop even deeper into her sensitive nature, to discover her love for preschool, and to witness her transformation from an only child to a big sister. Welcoming her little brother into the world this past September was probably the biggest event of the past year, and it has certainly had a resounding and lifelong impact on me. Though he is only 3 months old, he has already taught me more about love and faith than I could have ever imagined. He is such a joy to have, and I can’t imagine life without him. This past year, I pushed myself hard, and I accomplished a lot because of it. I’ve grown as a person, and I like the direction I am headed in. As always, though, I still have a long way to go. Last year, for the first time, I decided to choose a guiding word for the year. It’s a practice that has been popular for a number of years now, but as usual, I was a bit late to the party. I’m not much for making resolutions – I never manage to keep them – but I thought I would give the one word challenge a go. The word that I chose last year was forward. I was hoping to shift my perspective away from all of the things that I wasn’t doing, or the to-do’s that weren’t getting checked off of my list, to all of the the things that I was doing – in other words, the forward progress. And I have to say, this one little word made a world of difference to my mind set. Last January, I got a positive pregnancy test, so I was pregnant for the majority of this past year. I know there are women out there who love being pregnant, but alas, I am not one of them. I find it pretty miserable, to be honest, and I had a list of projects a mile long that I wanted to get done before baby #2 arrived. So, I needed this word more than ever. At the end of many days, when I was exhausted, aching, bloated, and continually expanding, with paint in my hair and dirt under my fingernails, I would ask myself, “Did you move forward today? Did you get anything accomplished? Did you keep putting one foot in front of the other?” And guess what?! I was able to say yes every. single. day. Seriously. I accomplished something – even if it was just keeping everyone alive – every day. And it was great to remind myself of that, instead of constantly focusing on the negative. Going forward (see what I did there?) into this year, I want to keep this mindset. I want to continue to remind myself of all the things that I am doing. BUT, I also have other goals in mind. And in light of these new goals, I have chosen a new word – courage. I have struggled with anxiety my entire life, but when I was younger, I didn’t let it hold me back. I was ambitious, and I had no problem going after what I wanted. As I have grown older, though, I have become more cautious, more fearful. What am I afraid of? Failure. I often don’t try things, or go after dreams, because I am afraid I won’t hit my goal. As a perfectionist and strong type-A personality, I get too weighed down by being the best. If I can’t be the absolute best at something, I tend to hold back and hesitate, instead of just going for it. I am also way too concerned with what other people might think of me. It’s a strange paradox because I so admire those who are unashamedly, 100% their authentic selves. Yet, I am often too afraid to let my own true self shine, or let my own voice be heard. Why have I become afraid? Where is the fear coming from? I spoke about this a bit in my post from last year, but I believe it stems from growing responsibilities. As a kid, my only responsibility was to go after my dreams. But now, I have a family to take care of and a house to run, which doesn’t leave a whole lot of time, money, or energy for me. I have learned over the course of the past year, though, (largely through starting and maintaining this blog) how important it is to do things for myself. I have always had a wide variety of interests, and I love to be creative. When I was younger, I took the ideas I had a ran with them. I put them into action, and I went after things. As an adult, though, I am simply full of ideas with no follow-through. This is why I have chosen the word courage. I am tired of just being an idea-girl. I want to be a doer, and the only way to get there is to be courageous. This blog was actually a great start for me. I am generally a very private person, so starting a public blog was a great leap for me. 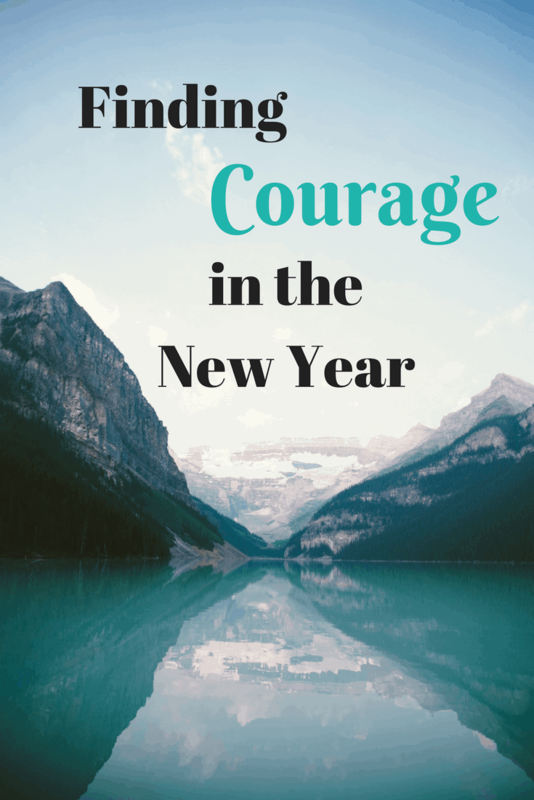 It took a lot, and still takes a lot, of courage to hit publish and put myself out there. I have enjoyed it so much, though, that I want to keep pushing, keep reaching. Just because I am an adult with more responsibilities doesn’t mean I can no longer dream. So, this year is going to be all about having the courage to step out of my comfort zone, to actually put my ideas into action, and to stop letting fear win. This was such a lovely read Amy and I have really enjoyed getting to know you in 2017. Wishing you and your family all that’s beautiful and good and courageous for 2018. Thank you so much, Michelle. I have so enjoyed getting to know you, as well. You truly are one of my favorites. I hope you have a wonderful 2018 also!